While Magnet-Schultz of America designs solenoids to perform above and beyond the expectations of its customers, there are constraints to the capabilities of any given design. Environmental factors, power supply errors, and general lifecycle wear can all lead to solenoid failures. This guide outlines some of the common failure modes, and should assist in the identification of the root cause of any common operating issue that may present itself. Some of these issues are irreversible, so it is wise to note these issues even if you have not experienced a fault in your application. They can be used to assess the operating conditions of a current unit or to create a specification for a new part that accounts for all the potential risk factors. Dust, dirt, and sand frequently work their way into solenoids and valves and dramatically increase the amount of wear and tear that occurs between moving parts. An accumulation of material can also effectively jam a solenoid plunger or valve into place. Depending on the materials and lifespan of a solenoid, the normal operation of the solenoid may create particulate material that creates similar issues. MSA tests and plans for normal particulate accumulation and makes sure that the unit is still capable of reaching its expected lifecycle. However, if you do not know how old or how many cycles your solenoid has been through it may still present an issue. Exposure to chemicals can cause damage to solenoid components. Even less harmful sounding chemicals like water vapor or salt can create significant complications. 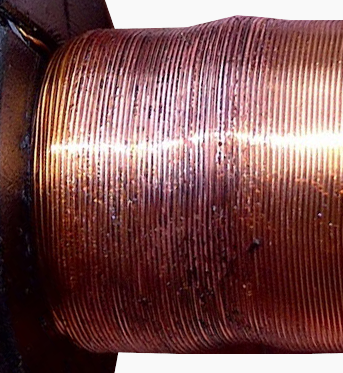 Corroded surfaces will interfere with the proper interaction of moving parts in the solenoid or valve, and can also compromise the coil by breaking into a sealed coil or damaging the winding of an exposed one. If the type of exposure the solenoid experiences changes at any point in its lifecycle, issues may appear. Even a seemingly small switch, such as from pure water to chlorinated water, will have a drastic impact on the type of plastics that can be used in the assembly. If a solenoid is provided with a voltage below its rating, it may not be able to generate enough force to complete its stroke. If voltage is too high, the coil may burn out, as detailed below. The amount of time that a solenoid is powered is also vital. Duty cycle indicates the amount of time that a solenoid coil can remain powered without overheating. Exceeding this rating will burn out the coil. A solenoid coil that becomes overheated will “burn out”, or short. This can be caused by an ambient temperatures outside the acceptable range or by an error in the applied voltage. The error does not necessarily have to be that the voltage is too high. A burnt coil can also be caused by a duty cycle or frequency that does not allow the coil enough time to cool after actuation. In AC solenoids, the resistance of the coil changes depending on the plunger position, which means a burnt coil can also occur if the plunger is unable to complete its full stroke due to a blockage. Even after a solenoid is de-energized, magnetism may remain in components with low magnetic permeability. This can cause the plunger to stick. This is an uncommon issue in MSA solenoids due to our material selection. Magnet-Schultz of America specializes in the custom engineering and manufacturing of solenoids, solenoid valves, electromagnets, voice coils, hydraulic tubes and coils, and locking devices. If you have any questions related to solenoid valve manufacturing or sourcing, you can contact us via email through the contact tab above or you can call us at 630.789.0600. We will be happy to assist in the development of your application. Browse our past blogs for a more in-depth look at solenoid functions and subscribe to the notifications for future posts!